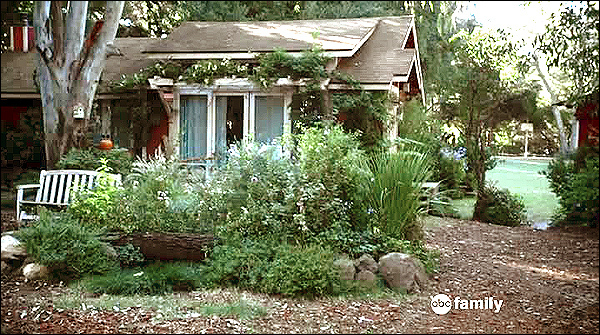 The ABC Family series, "Bunheads", is supposed to take place in Paradise, CA. But in reality, the show is filmed in Los Angeles County. 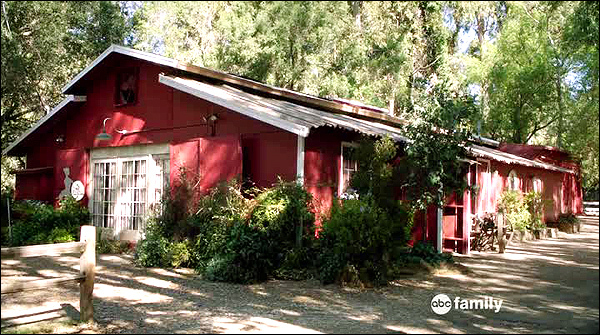 Calamigos Ranch, located at 327 Latigo Canyon Road, in Malibu, CA. (You can see an entire page full of photos of the barn here. rural & woodsy, complete with ponds, which allows for a lot of different looks. What exactly is Calamigos Ranch? That's not an easy question to answer. It's not strictly a movie ranch, per se, although they do have a lot of filming there. Covering 130 acres, it's bigger than Disneyland, and serves a number of roles. conferences, seminars, workshops - that sort of thing. 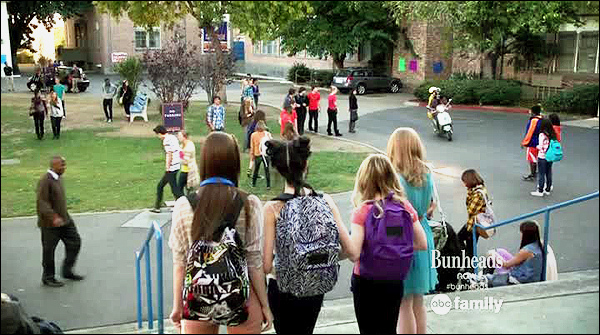 afford you a chance to wander over and see the "Bunheads" locations. called "Camp Summertime", and "Milestones Ranch", an adult rehab center. Here is the official Calamigos Ranch website. But if you're not in the mood to scale the hills of Malibu, don't despair. They have also filmed at several other locations. she discovers is owned by her husband's old girlfriend (Truly Stone). located at 419 Pier Ave, in Hermosa Beach, CA. side of the street, 7 or 8 blocks inland from the Hermosa Pier. In the current Google StreetView, the storefront houses Maximus hair salon. becomes a regular location, where the girls often meet up. That scene was shot in the very same restaurant that used to be the "Crashdown Cafe"
in the TV series "Roswell". It's located at 223 N. Citrus Avenue, in Covina, CA. it houses Casa Moreno Mexican grill. see out the windows and can read the signs on the businesses across the street. That view includes Joslin's Bakery (at 230 N. Citrus) and Covina Book store (at 234). 60 miles east of Calamigos Ranch, and 40 miles northeast of Hermosa Beach. So what about the school where the girls go? Where is Paradise High? It's actually LeConte Middle School, at 1316 N. Bronson Ave, in Hollywood. as does "Dexter", "Castle" and a number of other TV shows. 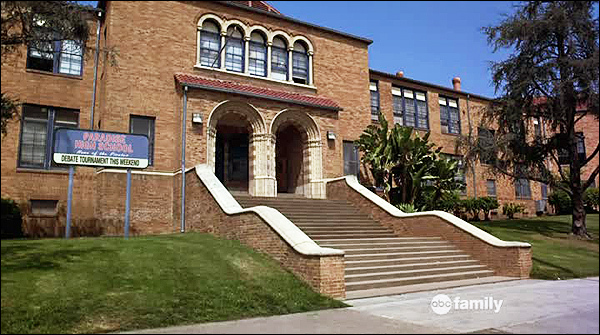 Instead, it is University High School at 11800 Texas Ave, in West Los Angeles. which faces in towards the athletic field (rather than towards the street).